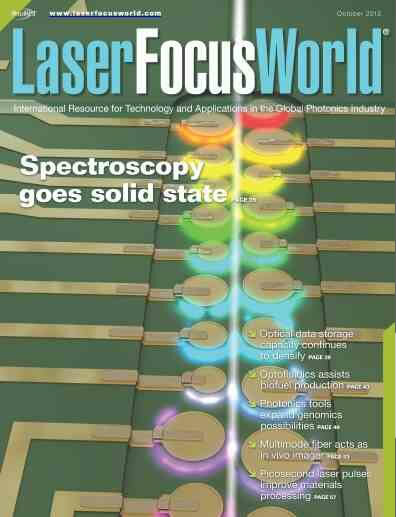 Laser Focus World has selected ZiNIR's Solo® Spectroscopy article as the cover story for its October 2012 edition. The article compares the Solo® Spectroscopy approach with conventional forms of spectroscopy starting with Da Vinci's 15th century observation of light diffracting off a prism which became the basis of wavelength dispersion. Solo® Spectroscopy differs significantly from traditional approaches since both the dispersion and detection of light occur within a single structure, a high-Q microdisk resonator, a series of which are arrayed along a waveguide to form a spectrometer. This structure means that stray light and loss of photons can be minimised and an excellent quality spectra produced from a miniature, no moving parts spectrometer. Read the article here, or download the PDF here.